Warner fanfare still raises my gooseflesh. Was there any sound that resonated so forcefully out of 50's televisions? We could barely pull ABC programming off signals Channel 13 dispatched, Asheville a couple hour's distant and ringed with mountains to break up already weak signals. Seldom was this network visible except through snow, yet it was home to Cheyenne, 77 Sunset Strip, and offshoots front and center at newsstands and record stores where WB stars loomed large. We got that message despite Clint Walker's being a fuzzy transmission, his face and others of WB origin plenty clear, however, on fan mags sold by pallet-loads. Kookie, Kookie, Lend Me Your Comb was a 1959 novelty song on Warner label I spun repeatedly at age five despite barest acquaintance with the series inspiring it. That year was highest point of Warners' home screen dominance, partnership with ABC yielding a hit series for any night you'd tune in. Routing these vid stars to movies was plain application of common sense, for what then-teen wouldn't spring quarters to see home favorites on large projection? Being this was Warners, few surveys were taken among talent to find how they'd prefer being feature-used. Clint Walker had toplined a 1958 western, Fort Dobbs, sort of a Cheyenne on 35mm, and in the series' accustomed black-and-white. There was $398,000 in profits to confirm that idea was a sound one. Walker looked to do more features and was particularly drawn to one that had been in development, Yellowstone Kelly, but WB said no and he struck ... for eight months ... which in TV terms was eternity. 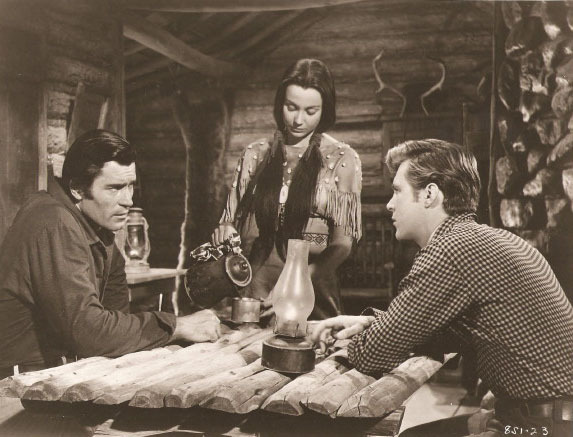 I wanted more lowdown on Big Clint's walkout --- he was absent a whole 1958-59 season --- that ended with reconciliation and Yellowstone Kelly, itself a last stand for old-style Hollywood westerns before revisionism grabbed hold. Some good folks at Warners made possible my telephone chat with the man himself, who's blessed with recall sharp as YK's frontier knife. Walker's been a boon to fans for years with numerous stops at autograph shows and an official website brim-full of info, photos, and neat merchandise. Walker's also been a prime mover for DVD release of his 1961 Gold Of The Seven Saints and newly available Yellowstone Kelly. If all celebrities were as gracious as Clint Walker, I'd aspire to being a Hollywood columnist (never mind there's so little Hollywood left). 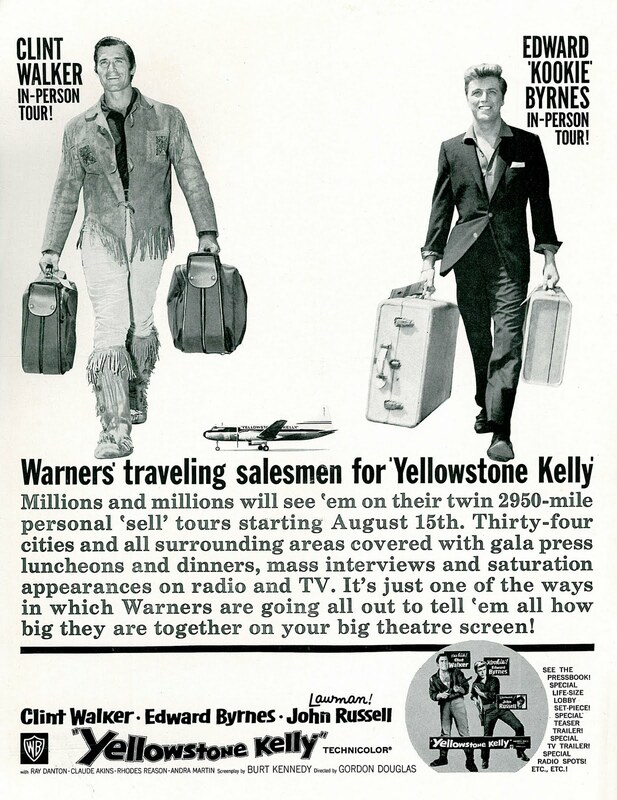 As a full career chat would fill books, we focused on the selling tour he did for Yellowstone Kelly in August 1959. Having seen many trade references to that, I wondered just what it was like hopping a plane to canvass theatres across the land, a fan swarm waiting at each stop. Walker said the whole experience really opened his eyes to number of people watching Cheyenne and knew him from said weekly fix: I remember flying over cities and seeing all those television antennas on houses. This was where I really came to realize just how popular the show was and the power of that little TV box. Warner bosses were already on to that truth and mindful of extended profit potential in selfsame box. 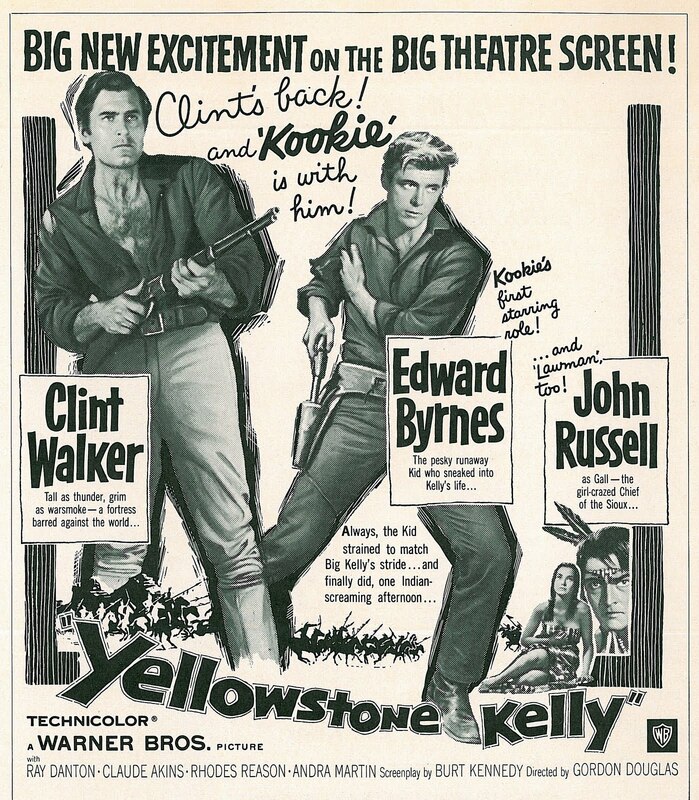 They'd cast Edd Byrnes, Sunset Strip's Kookie, as sidekick to Walker's Yellowstone Kelly, cinching the deal with Lawman's John Russell as Indian antagonist. All-media saturation had reached apex by 1959, so the three seemed everywhere on Yellowstone Kelly's behalf. When I came back in early 1959, it was with the understanding that I play Yellowstone Kelly. That was as important to Clint Walker as getting wages up to levels his Cheyenne success justified. The project had floated around Warners since early 1956 and word was John Wayne might play it under John Ford's direction. Walker liked Jack Warner personally and took meals with him from time to time, but entreaties to do Yellowstone Kelly fell upon deaf ears. The star's walkout was necessary to get this venture off the dime. Once he was back, it moved fast. That was in January, with Yellowstone Kelly announced for him the following month, and by April, they were on location in Arizona with plans laid for August 15 release. The director was fast and efficient Gordon Douglas (as good as any I ever worked with, said Walker), and dialogue came via sure hand of Burt Kennedy, late of Randolph Scott's stellar westerns. A Denver premiere would launch Clint Walker's twelve-city tour of Midwest territories, his plane loaned by the president of American Airlines. They painted "Yellowstone Kelly" across it, recalls the actor, and Warners lined up staff and representatives to receive us at every stop, in addition to those who travelled with the party. 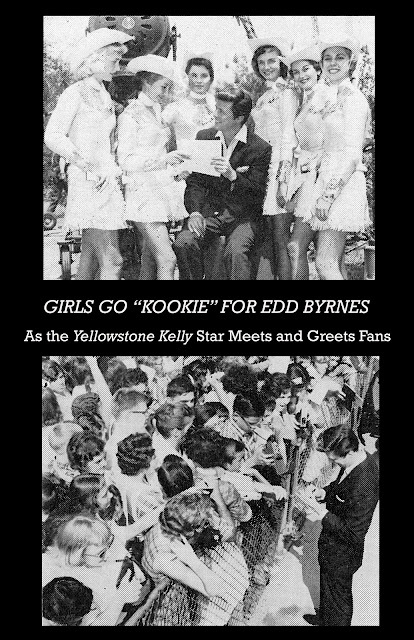 Leaving no promotional stone unturned, they also put Edd Byrnes on a plane headed Northeast where teen girls rushed Kookie for giveaway combs paying tribute to his recent hit song with Connie Stevens. I asked Clint Walker if he actually dressed in Yellowstone buckskins during the trip as the above trade ad implies. Not quite, he said, though western wear was garb of choice for stops he made in Texas. Appearances were spread among theatres, luncheons, radio and TV stations. There was a "Howdy Doody Show" I appeared on, and one program where they featured live animals. On that occasion, I was introduced to a sixteen foot python that wrapped himself around me, then looked me straight in the eye, which was pretty unnerving. There was also a black leopard the hosts wanted me to sit with, but he'd been scratching up his handlers that morning, so I passed. 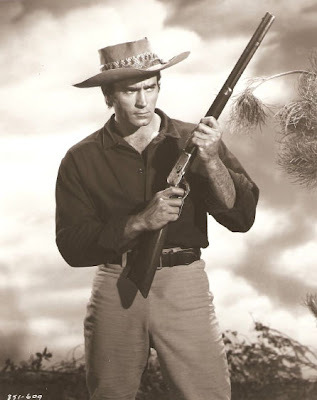 What would Clint Walker do once he stepped upon stages before a packed audience? Louis Quinn (accompanying CW as Master Of Ceremonies for the live spots) was a great asset to my theatre appearances, said Walker (Quinn was much-liked "Roscoe" on 77 Sunset Strip, a comic relieving figure he'd based on Ted Healy). Louie kept things moving on stage and told jokes to the audience before I'd come out. On one Lone Star occasion, Clint took the spotlight and was unexpectedly greeted by the viewing crowd's rendition of The Eyes Of Texas Are Upon You, perhaps his happiest memory of the tour. Being this was a new experience for Walker, stage work was limited to fielding questions from patrons, though later rodeo tours would expand his repertoire to skits and song. Yellowstone Kelly's sweep widened over Labor Day weekend. Small exhibitors embraced the Kookie comb gag on realization they could buy cases of the things cheap as un-popped corn. YK interest extended broader thanks to Walker's femme lure and interest he'd generate among grown-up customers. This star's base was more mature than pony-tails chasing Kookie, thus placement of Walker in the lead with Byrnes in support. Still, one hand washed the other. These two plus John Russell's following netted $1.8 million in domestic rentals and another $1.3 foreign. Showmen didn't mind cross-plugging the tube when favorites off it brought crowds like this. I was too young to watch closely that summer, but can imagine non-stop ad saturation Yellowstone Kelly received on free-vee. Sure it's no Rio Bravo, but Kelly got raves from happily expectant trades. 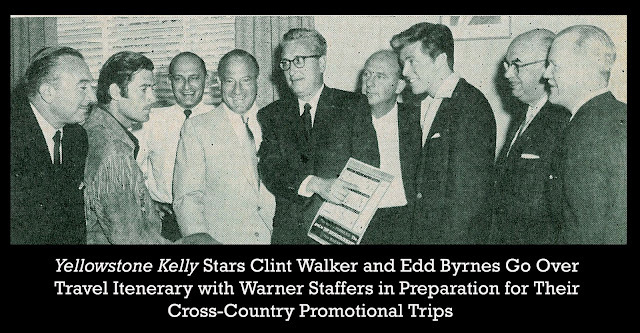 Said Boxoffice ... the trio (Walker, Byrnes, Russell) spells the answer to an exhibitor's dream, that capping accolades to make a Warner publicist blush. We're not so generous today thanks to fifty year's distance robbing most of awareness as to happy (and profitable to WB) days when television and movies walked hand-in-hand with magazines, comic books, and 45 RPM platters getting the YK message out to all who could buy tickets. Watching Yellowstone Kelly with those dynamics in mind doubles the pleasure of an already enjoyable show, however, and this is one I'd strongly recommend grabbing from Warner's Archive. 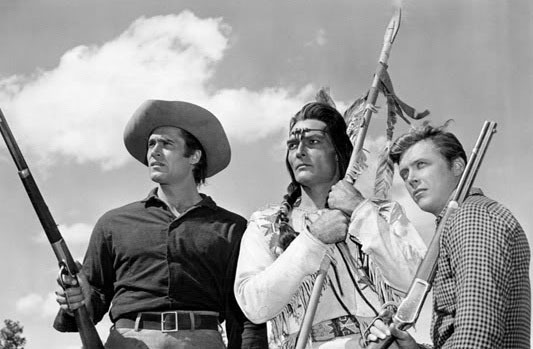 A Footnote To My Conversation with Clint Walker: The above still with Errol Flynn was one I just had to ask about. 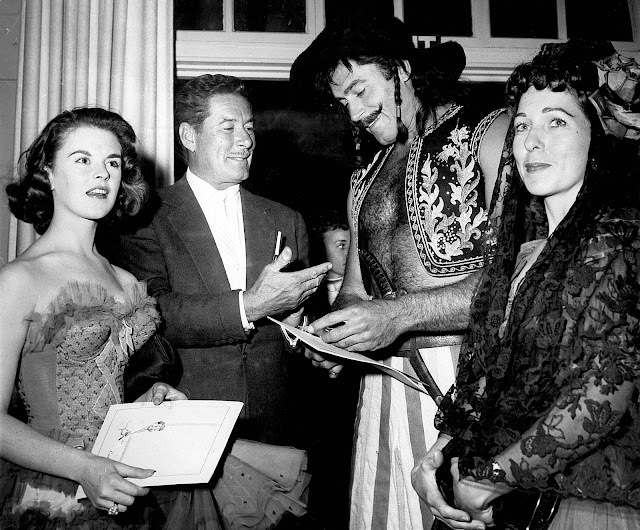 Upon my mention of a big star Clint had met at a costume party in 1957, Mr. Walker exclaimed, Errol Flynn! Being a fan, he regarded Flynn as a first-rate actor (still does), and remembered the encounter very well. It was the annual Ballyhoo Ball held on October 19, 1957. Seems Errol (sans festive duds) approached Clint in his costume (Sinbad? Gaucho? ), remarked So You're Clint Walker, casually walked a circle around the younger man inspecting his outfit, then said, You'll do as he reached for another drink (Flynn's date is holding a program with what looks like a caricature of Red Skelton on the cover --- was he host at this shindig?). Many thanks to George Feltenstein at Warner Home Video and Clint Walker for Info and Assist with Yellowstone Kelly. I've always loved "Yellowstone Kelly." Again, I saw it at the Saturday matinee in Whittier when it was first released and I never forgot it. At the time (1959) I was only 7 so I don't remember all the "ballyhoo" surrounding it (the campaign tour by Walker and Byrnes) but the film itself definitely made an impression on me. If Warner's had only put a LITTLE more money into it,....shot it in 'Scope and had an original music score (perhaps by Max Steiner, David Buttolph or Jerome Moross) I think the film would be considered a great Western today.....As it stands, I still love this picture. I have the newly released WB Archive Edition and it looks and sounds better than I've ever seen or heard it. I echo your sentiments John, this release is a MUST HAVE for film fans. Andra Martin (whatever happened to her?) is the most drop-dead gorgeous "indian maiden" to ever grace the screen! 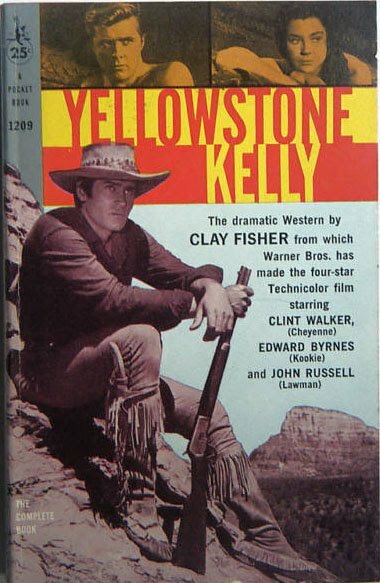 YELLOWSTONE KELLY had its local Charlotte TV market premiere on April 11, 1966. The cordial host announced the previous week that YK would be broadcast in color. But, lo and behold, on that April 11th evening, Mr. Kelly was not shown in color, as the station had received a black and white print from the distributor. The movie host was making his apology to the audience as I changed the channel, probably to HULLABALOO. Still, I wouldn't like to watch YK in B/W. John, the reason that the music sound very "Steiner-like" is because that's what it IS! Howard Jackson conducted the score and composed some original music for the film, but lots of it was Steiner. "They Died With Their Boots On" is played as Kelly and Anse are riding furiously across the meadow trying to escape from Sayapi and there are other bits and pieces of Steiner as well as other composers in the film too. I'm conjecturing here, but I'd say that Jackson had to come up with something VERY quickly (probably in no more than a couple of weeks) and had to make a "patchwork" of it because there just wasn't time for a wholly original score. Some of it's pretty silly and doesn't help the film ("dove eggs"), but it is what it is, and I love the film anyway. Something of interest is that Howard Jackson is also credited as one of the orchestrators on Paul Sawtell and Bert Shefter's score to Irwin Allen's 1960 "The Lost World" which was written about by you just last week. He also wrote some of the music for that film. In "Yellowstone Kelly" if you listen closely to the score as Kelly is about to ambush Sayapi and save Walleah (The night scene around the indian's campfire) you will hear music identical to the part in "The Lost World" where Lord Roxton is explaining his involvment with Burton White to the rest of the explorers........Guys like Jackson "got around" and usually saved the day on many an occasion!! When Warner Archive announced Yellowstone Kelly I hesitated, and in so doing no doubt aced myself out of getting one of the first 300 autographed by Clint Walker. I saw and liked the movie in '59, but figured I could live without it. You've persuaded me otherwise, so here I go -- autograph or no. James, I recognized the "Boots" cues during some of YK's action scenes, but I'm wondering --- did Howard Jackson compose the title theme? --- because I really like it a lot and it doesn't sound like anything Steiner did previously. I too grew up with the WB Westerns, week by week. 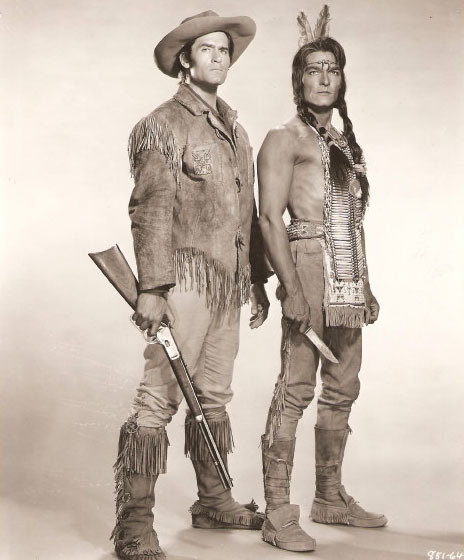 I was only four when "Cheyenne" debuted (in '57, evidently), so it was already 'there', by the time I began to be cognizant of what we watched (per my parents, obviously) every week. I do remember the actual debut of "Rawhide", in the typical debut month of September I believe it always was in those days (though I'm no authority), in 1959. We were all looking forward to that one, and it did not disappoint. But that gets us off the subject of the WB Westerns. I loved the 'scratchboard'-style illustrated title art that bound shows like "Cheyenne", "Maverick", and "Sugarfoot" to one another. I also remember a show called "Bronco" but can't remember the titles, although I certainly remember the upbeat title music. ALL these shows had great title music. "Maverick" by veteran film composer David Buttolph (who composed the effective scores for "House of Wax" and "Beast From 20,000 Fathoms", e.g.) was my favorite by far. However, as you say, even the other WB shows had a wonderful 'house style', composed of many elements, including casting, music, logos, the works. I vividly remember "77 Sunset Strip" and its catchy title theme every week, not to mention Edd (love those two "D"s....not really, I mean it ironically!) Byrnes doing something in his little title sequence turn. At first I thought I remembered him patting the tailfin for some departing '59 convertible land boat and actually pirouetting 180 degrees! But that just seems too ridiculous. It must have been something more modulated, like a smug grin and a couple trips through his pompadour with his pocket comb. I'm glad Clint Walker came off as nice to you as he seems in many of his screen portrayals. The guy was certainly a monument to testosterone in his youth....my God! He even makes Errol Flynn look inadequate! (More on that.) I'm broke right now or I'd take a flyer on "Yellowstone Kelly". The one I'd most like to see on DVD, however, is Paramount's "Night of the Grizzly", which was suspenseful on the more conventional level of decent guy vs. local toughs, as well as downright scary scenes of Walker's confrontation with the eponymous oso, which was photographed in such a way as to make it seem like a supernatural monster! Being a film music fan always, I was also very impressed with the score by Leith Stevens, including a lovely main theme, as well as a very pretty, unrelated tune supposedly 'composed' by Walker's character for his wife, played by Martha Hyer, called "Angela" as I remember. Is the lady with the program, who you surmise was Errol Flynn's date at that ball, the same girl who starred rather unspectacularly in William Castle's camp classic "House on Haunted Hill"? I'd look that one up on the IMDB to obtain the name, but I'm too lazy! Thanks as always for another entertaining round trip in your time machine, John. Mr. McElwee, you are a great writer and a fount of wonderful pics and info. Thanks so much! Regarding David Buttolph's theme music for Maverick: Don't know if I've shared this with you before, but if so, here it is again. One night on a late-late show in L.A., I was watching the 1956 The Lone Ranger, Warners' big-screen spinoff of the TV series. In one scene, as the Ranger sat on Silver talking to one of the good ranchers, what should I hear on the soundtrack but the jaunty strains of the Maverick theme! This was a full 19 months before the series debuted on ABC; obviously Buttolph (or somebody at Warner Bros.) knew a good theme, and didn't want to waste it. Every one of your posts is better than the last. The fact that you'd take the time to actually find and interview a film's star is simply amazing. Or just plain gracious. 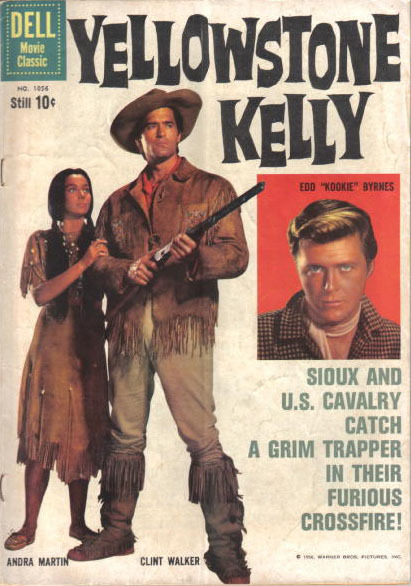 "Yellowstone Kelly" was the co-feature on the RKO neighborhood circuit in NYC in 1959. The main feature was Jack Webb's "-30-" with David Nelson. My Saturday matinee included 11 cartoons and Edward "Kookie" Byrnes 8 x 10s (while supplies last). I have a copy of the ad and it's promoted as a Big Holiday Show. I believe it was Veteran's Day. When I saw YK as a a kid, I was wondering what Kookie was doing in it, I had him in my head as that character forever. Walker was an un-tapped acting talent, really, and although he may have been the finest physical specimen ever on TV, or film, he was niched in. Once in a while "Cheyenne" would give him a chance to show a different approach, but not often enough, and I can understand why - don't mess with a good thing, but I wish he'd had more chances to show his range. Curiously enough, my favorite episode of "Cheyenne" - "The Empty Gun" - had John Russell guest starring as former gunfighter with a bum trigger hand, back in town to see his son, who doesn't know him. Cheyenne undertakes to watch his back, and the byplay is elegiac and revisionist to a degree. It starts with a gravedigger and ends with a gravedigger, book-ending a tight little story, that was well-written, and more importantly, well-shot in a noir-ish style by journeyman TV cinematographer Perry Finnerman. It had more than a few unusual takes for a TV western, and particularly the reveal at the end of Russell's gunman's sacrifice of his own life for his son's future - a wonderful turn-away of Russell's determined face, and then turn-back to face the camera, with a rill of blood running from a corner of his mouth. Not the usual TV western episode at all. 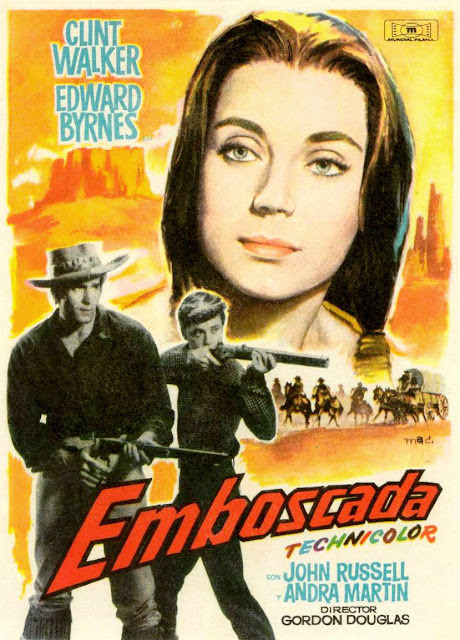 I'm glad the Western Channel is showing these, and "Have Gun, Will Travel", and other great TV westerns. OOps, I forgot on my mention of "The Empty Gun", it wasn't Russell's character's son, but the son of another man he'd killed, sorry 'bout that. hey, I love your blog, and this post aabout WB-TV!